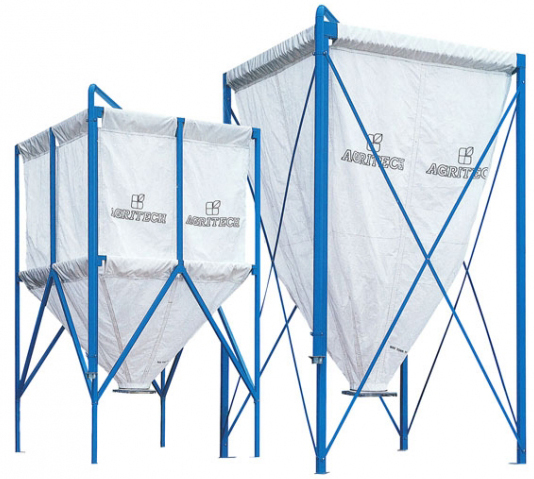 Company Agritech Slovakia proposes a huge range of silos made in "trevira" fabric, such silos complete our standard range of silos made in fibreglass. Trevira silos are supported by a metallic framework which can be painted or hot galvanised. The main characteristic of this special fabric is its high tenacity which assures a high degree of resistance and long-lasting endurance. Model STR is equipped with a reinforced metallic framework. It can be delivered, upon request, equipped with pneumatic filling pipe and other extraction accessories. Model SIT has a structure easy to assemble and cheap. It can be delivered, upon request, equipped with pneumatic filling pipe and other extraction accessories.